People buying a used car need to make sure that they check a multitude of potential problems. One of the most common of these is unevenly worn tire treads. This problem affects many tires and causes a myriad of driving difficulties, including control issues in snow and rainy weather. As a result, car owners need to take the proper steps to ensure that their treads are durable and not about to break down. Understanding why tire treads wear down unevenly – and why professional help is so smart – can help drivers get their treads repaired after buying a used car. Individuals buying a car inherit all of the problems that the previous driver caused. For example, some people may neglect to rotate their tires properly or may put an improper level of air in the tire. 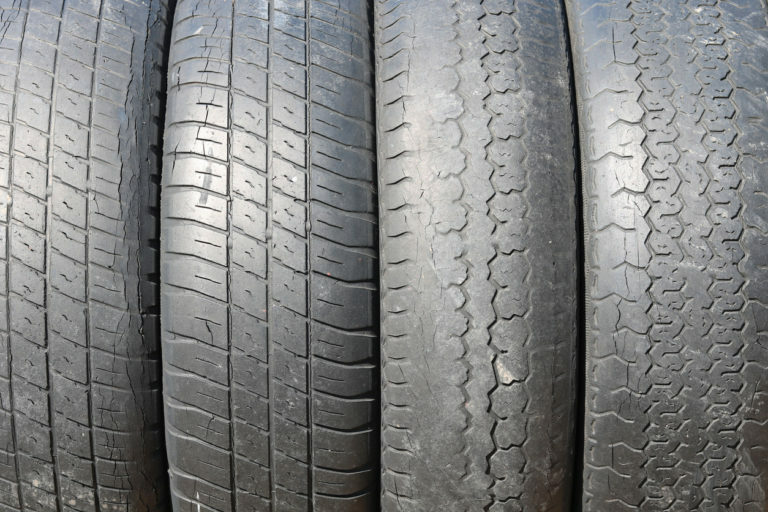 These issues can trigger excessive wear and tear on a tire’s treads. However, the wear might be uneven across the tire surface, affecting certain areas but not others. Uneven tread wear can decrease the lifespan of a tire because of increased potential for bursts or leaks in excessively worn areas. For example, a tread worn down farther on one side than another may put undue pressure on this worn spot and could potentially trigger a burst. Other problems, such as reduced winter maneuverability and faster hydroplaning, may also occur when a tire’s treads are unevenly worn. As a result, car owners need to know when to take their car in for tire repair or replacement. The penny test – Slowly insert a penny into a tire’s tread groove with the head of Abraham Lincoln facing down. If all of the head is visible, the tread is too worn to be safe. Test multiple areas of the tire for maximum safety. The quarter test – This test is very similar to the penny test. Insert the quarter, with Washington’s head down, into the tread. If the tread touches the head, the tire tread is safe and doesn’t need to be replaced. The treadwear indicator bar – Each tire on a vehicle has a small bar installed at the bottom of the treads. When this bar becomes visible, the treads of the tire are very worn and should be replaced or repaired as soon as possible. These simple tests should not be considered the ultimate guide to the safety of a tire. They are not a DIY diagnostic tool so much as they are a general gauge of a tire’s health. The only way to know for sure if a tire is too worn for safe driving is to get professional help from a respected and high-quality tire repair and installation specialist. People who just bought a used car and are worried about worn treads should seriously consider professional replacement to avoid dangerous driving situations. Don’t try to make these kinds of repairs or replacements on their own, no matter how skilled you are as an amateur mechanic, because it likely will end poorly. So if you just bought a new car and are worried that the treads are heavily worn, please don’t hesitate to contact us at Evans Tire & Service Centers to schedule an inspection appointment. Our professionals will help identify any issues with your tires and replace or repair them, as needed.